You could hardly miss this story, as it seems to have been all over the media this week. 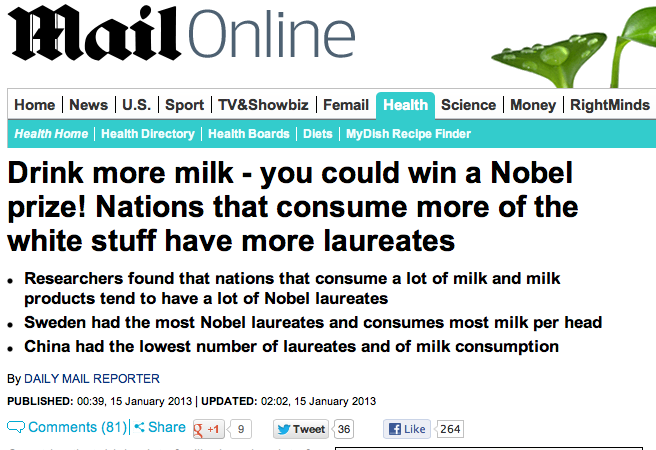 The headline of the Daily Mail version of the story focused on a correlation between a country’s milk consumption and the number of Nobel Laureates from the country. The story went on to cover a similar correlation between chocolate consumption and Nobel prizes. The same story appeared around the world including Bangladesh, USA (Time), Pakistan and Ghana. You might just dismiss this story and the usual newspaper rubbish, but when you read through the story it is based on material from the Practical Neurology (A British Medical Journal publication) and from the New England Journal of Medicine. When you look at the Practical Neurology article one can feel the authors tongues firms in their cheeks and in the second line of the article they acknowledge that correlation obviously doesn’t imply correlation. This story is useful for two different types of teaching. At a basic level it’s a nice way to illustrate the idea that correlation doesn’t imply causation. In discussion with students I’m pretty sure you could come up with a lot of possible variables that might me mediating this relationship. My own mind wanders to the figures for lactose intolerance in Asian countries being 75% plus. At a much higher level I think there is an interesting discussion to be had about the responsibility of scientists when publishing correlational data. Whilst both the papers that this story was based on were published in peer-reviewed journals (and were thus aimed at an audience who would understand correlation and causation) it’s not unreasonable to suggest that given the subject matter both the authors and the journal editors would be aware that the popular press were likely to pick it up. Under these circumstances my question is ‘Do the authors and editors have any responsibility to consider the wider audience and their lack of understanding and correlation”? It’s all very well for us to bemoan poor science reporting in the popular press, but we ar least partially responsible ?